Indonesia is the biggest islands country in the world, located in tropical area that warm always in the year. Have Indonesia become your destination vacation! There are many kinds of object tourism in which you can not find in your country, such as: the beautiful beach to have swimming and surfing, the beautiful mountain, the great historic things: Temples, Crater, etc. There are also varieties of Indonesia culture. The cost to have a vacation to Indonesia is cheap. The society are very friendly and make your vacation will terrific. Welcome to Indonesia, A Tropical Paradise in The World. The name Indonesia has its roots in two Greek words: "Indos" meaning Indian and "Nesos" which means islands. It is an appropriate description of the archipelago as there are estimated to be a total of 17,508 islands, of which only about 6,000 are inhabited, stretching for 5,150 km between the Australian and Asian continental mainlands and dividing the Pacific and Indian Oceans at the Equator. Five main islands and 30 smaller archipelagoes are home to the majority of the population. 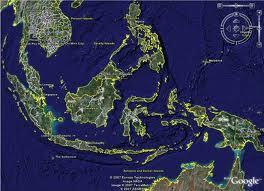 The main islands are Sumatra / Sumatera (473,606 sq.km), Kalimantan / Borneo (539,400 sq.km), Sulawesi / Celebes (189,216 sq. km), Irian Jaya / Papua (421,981 sq. km), and last but not least : Jawa / Java island(132,187 sq.km), home to 70 percent of the country's population. Indonesia shares Irian Jaya with Papua New Guinea and two thirds of the island of Kalimantan with Malaysia and Brunei. The islands and people of Indonesia constitute the fourth most populated nation in the world. As a democratic republic, Indonesia is divided into 33 provinces, special territories and classified geographically into four groups. First are the Greater Sundas, made up of the larger islands of Sumatra, Java, Kalimantan and Sulawesi. Second are the Lesser Sundas, consisting of smaller islands from Bali eastward to Timor. Third is Maluku/Molucca which includes all the islands between Irian Jaya and Sulawesi. The fourth and final group is Irian Jaya in the extreme eastern part of the country.